A safe way to strip away old, unwanted paints, shellacs, and many other finishes. Low Voc’s. Can be used indoors even in the winter. Soy-Gel by The Real Milk Paint Company is an industrial strength and consumer friendly paint, varnish, and urethane remover made from 100% American grown soybeans. The lower evaporation rate of Soy-Gel and its gel formulation make it possible to remove several layers of paint in one application. During the removal of lead based paint, lead becomes encapsulated in the gel, preventing airborne lead particles, allowing for safe and easy disposal. Soy-Gel contains no methylene chloride, is not an alkaline based stripper and cleans up easily with water. Unlike more traditional paint strippers Soy-Gel gets you through the paint removal process without the odor. Indoors or outdoors, you can be guaranteed a safe restoration process with Soy-Gel. 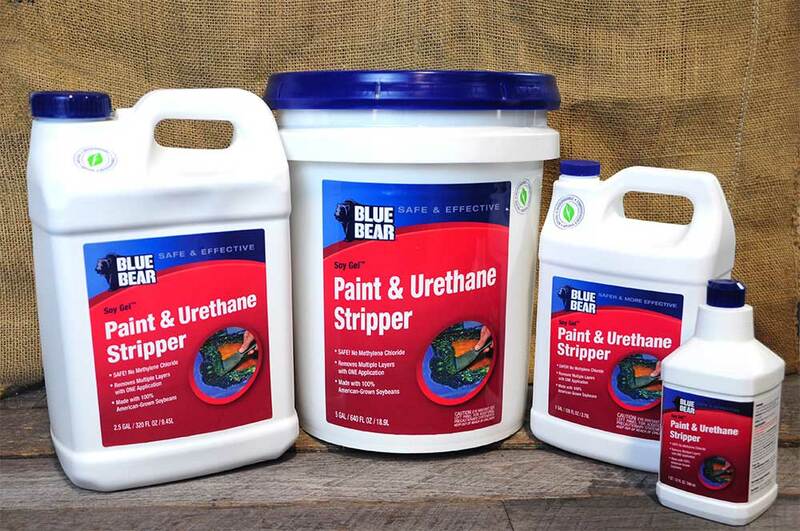 If used on fiberglass surface and dulling occurs, restore luster by using rubbing compound. For prolonged periods, 18 hours or more, damage could occur. For veneer finishes, exposure should be in short intervals, 5-10 minutes. Longer exposure times could result in damage. It’s almost a year later that my girlfriend and I ordered your Soy Gel and Raw Tung Oil products. I cannot say enough about the high quality, low vapor off-gassing, and ease of use of these products. We have a 1915 Craftsman and are in the process of refinishing the bathroom and the floors throughout. Since we live in Redwood Country, the house is constructed of mostly old growth redwood, so our goal is to uncover and reclaim the character of this beautiful wood. I used the stripper to take off 6 layers of paint from a 6 ft. cast iron claw foot bathtub, a solid Redwood door and door frame, and various old growth redwood trim boards used for a built-in cabinet. I will next use it to take off paint from the recently “re-discovered” tongue-and-groove floorboards in our home. The Tung Oil was applied on reclaimed, old growth Redwood tongue-and-groove paneling that was attached to the walls, hidden by the crumbling sheet rock. Thankfully, the boards were mostly clean on the ‘good’ side, so we simply sanded them, applied the tung oil and created a wainscoting and surround-shelf for the entire bathroom. The end result is a warm, rustic, dazzling bathroom. I love these products – I have tried JASCO and Formby’s, products you typically find at any home improvement center, and yours are far superior. The next thing we will be trying, of course, is your Real Milk Paint®. Just wanted to drop you a note about a product I purchased from you. I have never written regarding a product before, but I had to send a note about Soy-Gel. This has to be the most amazing stripper I have ever used!! We are building a house and I have an old kitchen table (grandmothers) that I wanted to refinish. I have kids that are involved in a lot of activities so finding a time and place to work on this kind of project is tough. Last night, I stripped the top of the table in no time flat (in the kitchen) while cooking supper and doing laundry! No Odor!! Stop and go as often as you like. I even made a trip to the store. WOW! Didn’t have a mess, no fumes!!! UNREAL!! Everyone should try this! I’m looking at other pieces now! It really takes anything off so fast! This stuff is really something!!! It really works! The Best Stuff!! Thanks a lot! Just wanted to let you know how pleased I am with the purchase I made. My order arrived very quickly and the results are amazing. There was no bad smell while removing the paint and it easily removed two coats of paint and a very old coat of varnish. My only regret is that I bought a small bottle instead of a larger one. I will be ordering more very soon and I also can’t wait to try the milk paint!